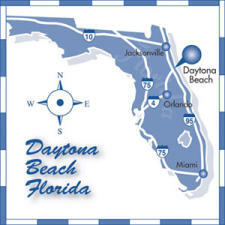 Driving to the Daytona Beach area is easy, as two of the state&apos;s major interstates intersect here - Interstate 95, which runs north and south and Interstate 4, which comes in from the west. Other major roads leading into the area include U.S. Highway 1; U.S. Highway 92; State Road 40, which connects to Interstate 75; and Highway A1A which runs along the beautiful Atlantic coastline. Drive north on Interstate 95 to exit numbers 261A through 273. Go east to reach the beachside areas. Drive east on Interstate 4 from Tampa or Orlando. Take exit number 132A and go north on Interstate 95. At exit number 261A, take U.S. Highway 92 east to Highway A1A and the beaches.